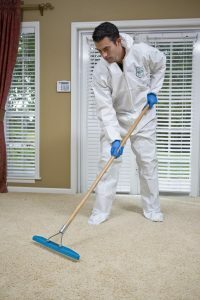 Extraction involves removing standing, pooled and migrating water as quickly as possible from hard surfaces, carpet, and other textiles. With water intrusion, it’s not how much you remove, but what you leave behind. Beyond rapid response to a water intrusion is the need for maximum extraction of water. Extraction involves removing standing, pooled, and migrating water as quickly as possible from hard surfaces, carpet, and other textiles. Secondary damages are damages that occur after the initial water intrusion and immediate damage by the water. The value of the initial and continual extraction of water from hard surfaces and carpet until only a damp phase is encountered is crucial to reducing secondary damages. To support the importance of extraction, independent tests were enlisted to evaluate which extraction tool connected to the same vacuum extractor removed the most water. The carpets used were 24 oz. 100% Nylon Saxony over 7/16-bonded urethane pad. Those that used the conventional carpet cleaning wand with six passes removed 42% of the water from the carpet and pad. That means that 58% of the water was left behind. In 100 square yards of flooded carpet, water remaining after extraction measured 203 gallons. It is evident that the carpet wand was not designed to extract water from flooded carpet and pad. Unfortunately, too many companies still rely on that method for extraction. Leaving that much water behind to be evaporated required more equipment and more time. Also tested were other extraction tools that were more efficient than the standard wand for removing water from flooded carpets and pad. Water Claws removed between 75-81% of the water, which equates to about 53-65 gallons of water still left in 100 square yards of carpet. The total time required to dry the structure and content was decreased due to less water left in the carpet alone. The self-propelled extractors realized the greatest water removal percentages. Both manufacturers of self-propelled units tested removed between 87-92% of the absorbed water from the carpet and pad leaving only 28-43 gallons of water in 100 square yards. Those companies utilizing dehumidification equipment that removes 13-14 gallons of water per day based upon the approximate water left should take around three to four days to dry 100 square yards of carpeted area. This of course does not take into account the absorbed water left in structural materials. The drying time line is extended if hardwood floors or other Class 4 drying materials are encountered. Class 4 materials are defined as those materials that resist drying based on their construction and permeance factors. Technicians extracting water must take their time and maximize extraction as much as possible. In the past, their haste to set up fans and dehumidifiers left behind too much water that caused drying to take ten to fifteen days. Leaving behind as little water as possible in carpeted areas translates into less water absorbed and less water evaporating raising the humidity. If the humidity elevation can be minimized and controlled, less dehumidification equipment will be required for less time. Less time required to dry 100 square yards of carpet is a convenience to all. We must remember how important rapid response is to the success of the above figures. Water that absorbs into structural materials such as plywood and wood framing cannot be extracted-only evaporated. The variable in approximating drying times is enormously affected by how long the water has to take advantage of this situation. Utilizing correct water extraction methods can potentially save tons of money in the long run. Contact PuroClean Certified Restoration to take advantage of maximum water extraction and quick dry times.